It's almost time to unite DC's greatest heroes against an otherworldly threat in the Justice League movie, and a new clip gives us a taste of what happens when Batman, Wonder Woman, Flash, Cyborg, and Aquaman gang up on a bad guy. It should go without saying, but in the interest of personal safety I'm going to anyway: SPOILERS AHEAD. 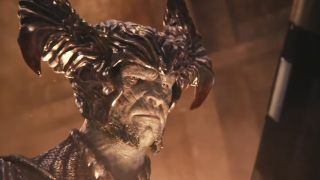 It starts in the middle of a fight with Steppenwolf, the supervillain in Justice League. The immortal Steppenwolf easily shrugs off a missile attack, lobs a quick verbal jab at the team, and then releases a torrent of water from Gotham Harbor in an effort to drown the pesky do-gooders. Aquaman works some water aerobics magic in to save the day and prove he's definitely not the lamest of the superheroes. But really, what's impressive about these 75 seconds is everything it manages to pack into a relatively short amount of time. Wonder Woman and Batman are clearly serious about the fight, while Cyborg's back-and-forth with Alfred is chuckle-worthy. Steppenwolf's casual dismissal of the team's attack gives us an idea of how he views Earth and how powerful he is. Flash gives us another moment of comedy relief before Aquaman does his thing. Everyone gets a turn in the spotlight, every personality comes through. Plus, this is the best look we've gotten at Steppenwolf, right-hand man of ultimate DC antagonist, Darkseid. I admit I was worried about Justice League - but this clip makes me think it could be a fun ride. We'll find out when the film hits theaters on November 17.